What are the connections between these three things? In his terrific book Understanding Comics, Scott McCloud explains that comics are special because all of the real action occurs in the gaps between panels – this is the part that readers fill in using their imagination. A huge amount of effort and creativity goes into making the comic, but then the reader finishes the story in her head. A well known New York photographer goes to a socialite party. On his way in the hostess says to him, ‘Oh I love your photos, you must have an amazing camera!’. They have dinner and at the end of the night, on his way out, the photographer comments to the hostess, ‘I really loved the food, you must have an amazing stove. Most people in the US can’t cook. So you would think that reaching out to the masses with entry-level cooking instruction would be a smart business move. In fact, as the Food Network and cookbook publishers have demonstrated over and over again, you’re way better off helping the perfect improve. You’ll also sell a lot more management consulting to well run companies, high end stereos to people with good stereos and yes, church services to the already well behaved. 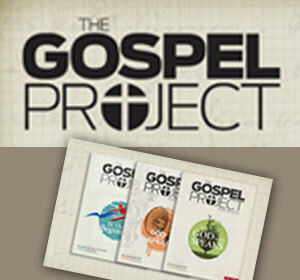 I see the same story in all three pieces: Creativity happens in the gaps. I’m a lousy cook. So if I go out and buy The Fat Duck Cookbook, and follow each recipe as closely as possible, I still won’t be cooking like Heston Blumenthal. Why not? Because I don’t know enough to fill in the gaps. 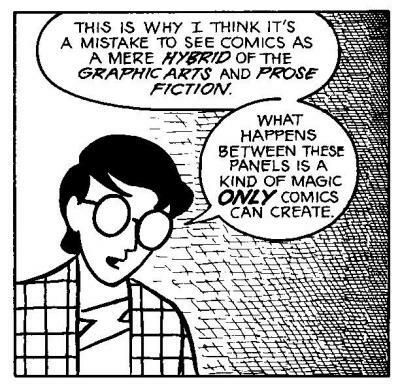 As much as I love Scott McCloud’s book, I disagree with him when he says that “what happens between these panels is a kind of magic only comics can create.” I actually think that applying creativity and imagination in the gaps also explains the other two stories. We can only sell cookbooks to people that are already great cooks because they have the skills needed to be able to fill in the gaps in a recipe creatively and with imagination. And this is why, as in the case of the photographer and the cook, focusing on tools can be incredibly misleading. A couple of years ago, I met with the senior management team from a really large organisation in Brisbane. They wanted to talk to me about being more innovative. We started by talking about what innovation is, and then quickly went through managing innovation as a process, and a few other key ideas. As I talked, there were sheepish nods around the table. They didn’t know enough about innovation to fill in the gaps. They wanted to buy the innovation version of the expensive camera, or the great stove. 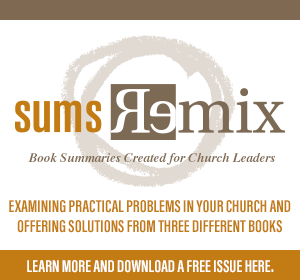 They had the same problem that Seth Godin outlines: they’re actually not good enough innovators to benefit from the tools that are available to them. What Should You do If You’re Just Starting Out? Forget about tools. You have to build your basic innovation skills. You need to get everyone on the same page in terms of defining innovation – and your definition might be different from everyone else. Connect innovation to your overall strategy. They are two different things, and innovation needs to support your strategy. Build your capability to experiment. Here is a seven-step process for starting to innovate quickly. Start thinking about innovation as a process, not as an event (just ideas). Once you’ve done these things, then you can go out and start buying expensive tools to support innovation. But only then. There are no innovation short cuts. You have to build your skills first. Once you have, then you’ll have enough knowledge to really use your imagination. 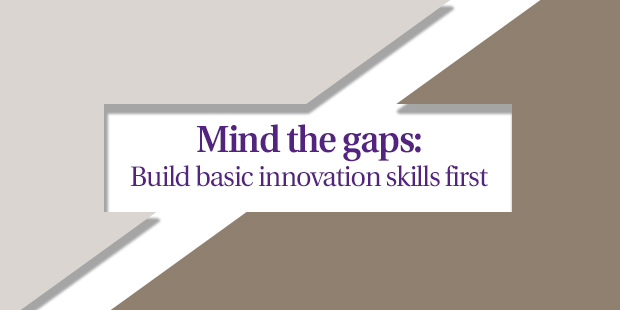 Then you’ll know that innovation happens in the gaps.